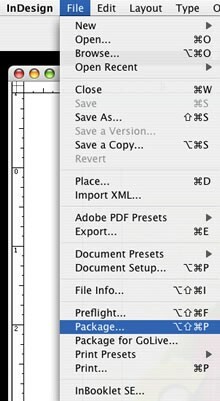 Adobe InDesign provides an option under the file menu for preparing your document for submission called Package. 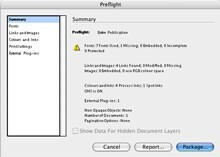 When you select the Package option, InDesign will gather information about your publication and then prompt you if there are problems preflighting your file. 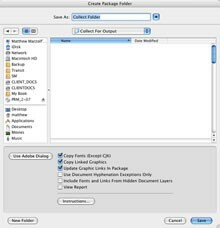 Once you have reviewed and made any necessary corrections, you will be asked to save the file before continuing.Once the file has been saved, you can enter pertinent information, including printing instructions, in the dialog box that appears next. Once you have entered any information you feel necessary, you can continue by pressing the button in the upper right hand corner.The next window to appear will prompt you to choose or create a folder for your document and related files that you choose to submit. Copy Fonts and Copy Linked Images as well the option to update your linked images are all selected by default. 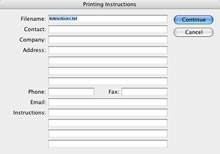 The option to revise your printing instructions is also included. The option to create view a report detailing any problems performing these operations is also available. Once you have selected all of the necessary options, click package to finish.